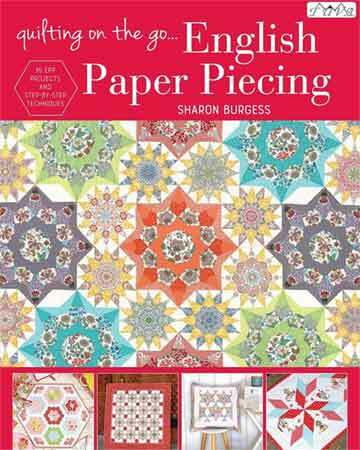 Quilting on the Go by Sharon Burgess is full of gorgeous projects for English Paper Piecing. 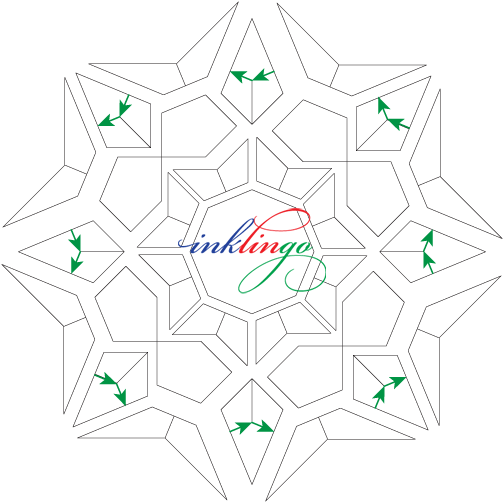 The new Inklingo shape collections for Celestial Star (the cover quilt) are the result of requests from quilters. They wanted to be able to print the shapes on fabric so they could sew by hand or by machine, so I contacted Sharon. 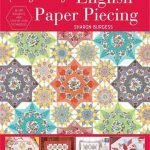 Sharon and I both saw it as a perfect opportunity to make her beautiful designs accessible to quilters who don’t use English Paper Piecing. Let’s include everyone! 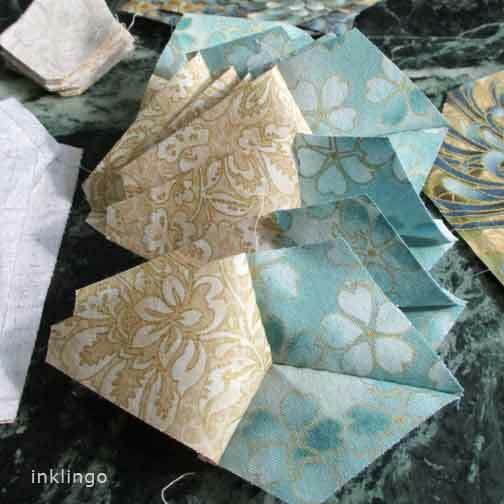 The projects are too pretty to limit them to a sub-set of hand piecers. 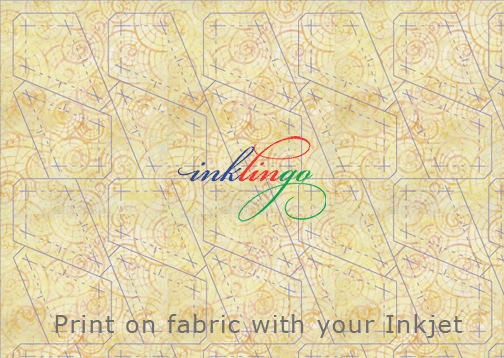 The 3 new Inklingo Celestial Star shape collections are perfect for quilters who who sew by machine or by hand with a running stitch. 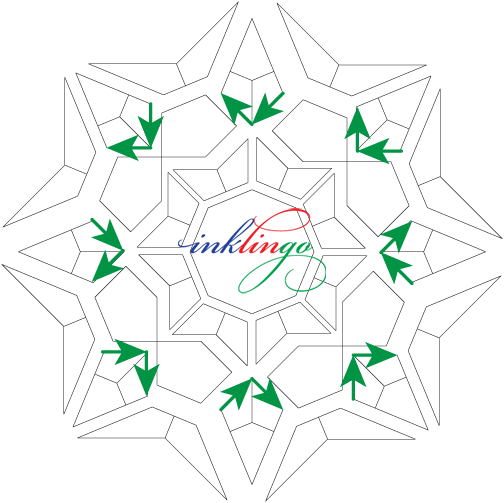 There are also 8 good ways to use Inklingo for EPP, if that is the method you prefer. 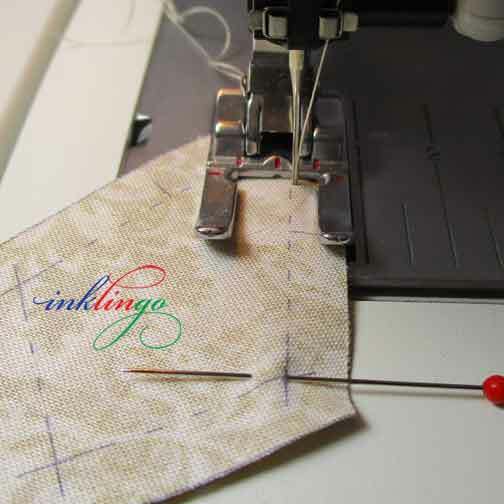 Inklingo is all about making quilting more accessible, so we love including more quilters—everyone! I took photos while I was sewing my first Celestial Star “Color Burst” unit, so I can show one way to construct this complex block by combining hand and machine piecing. I call it “hybrid” piecing. Like most quilters, I won’t live long enough to make all the quilt designs that intrigue me. I love a portable project and I want to spend my time carefully, so I often combine hand and machine piecing in a hybrid. I examine the block carefully to decide which seams to sew by hand and which seams to sew by machine. Often it depends on how much “continuous stitching” I can find—and Celestial Star is a gold mine! Continuous stitching is one of my favorite things about hand piecing. At the end of every seam, before I cut the thread, I look to see if I could continue just by turning a corner. I have written about continuous stitching many times before, including in Quilted Diamonds (2002), Quilted Diamonds 2 (book and DVD, 2004) and in videos on YouTube, etc. 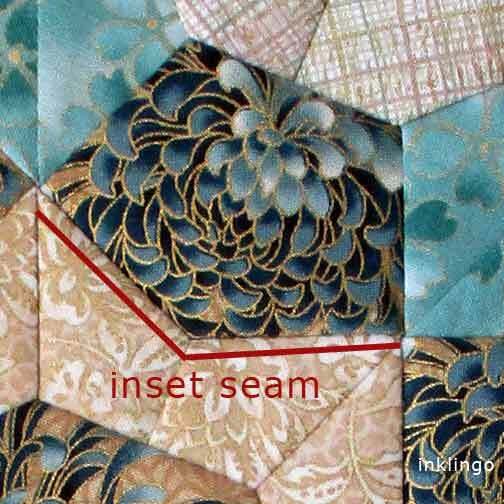 “Inset seams” are the ones that are perfect for continuous stitching—the same ones quilters historically avoid by machine, so the seams divide into two separate categories. Continuous stitching is so relaxing and enjoyable that I often plan my route in advance on a diagram of the block. Hand piecing this way is a “zen” experience. It is totally relaxing with a sense of well-being AND it is an efficient way to work, so I can finish in a reasonable amount of time. In the Color Burst unit for Celestial Star, there are seams that don’t work well for continuous stitching (red lines, above). The good news is that in this case, the seams that don’t work well for continuous stitching DO work well for chain piecing by machine, so that was my starting point. Wow. Is this fast! I pinned at the END of the seam, so I could stop in the crosshair. Sometimes I sew edge to edge. In this case, I sewed from edge to crosshair. Sometimes I sew from crosshair to edge. It works either way, so it’s up to you. Why not try it both ways, to see what you prefer? Zip. Zip. Zip. I chain pieced the seams on 8 pairs of Wings, 8 pairs of turquoise “4-point star” shapes, and 8 pairs of gold “4-point star” shapes. I could have continued with more machine piecing but that was enough to give me a fast start. A few minutes of chain piecing set me up for a couple of hours of continuous stitching by hand in a comfy chair watching TV. Several different sequences are possible. I started by sewing these 8 three-piece units. I like to plan my route to maximize the continuous stitching, so I never sew fewer than two seams before breaking the thread. Then I added all these units to the Octagon with 8 starts and stops. This is just one example. You might prefer different routes. 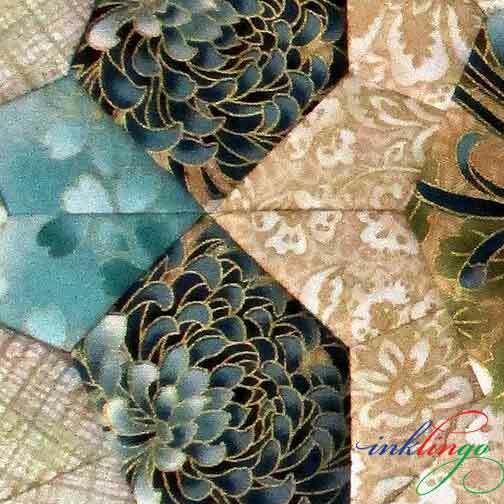 If you are just learning how to hand piece, every detail is covered in the two-hour hand piecing lesson on the Quilted Diamonds 2 DVD. 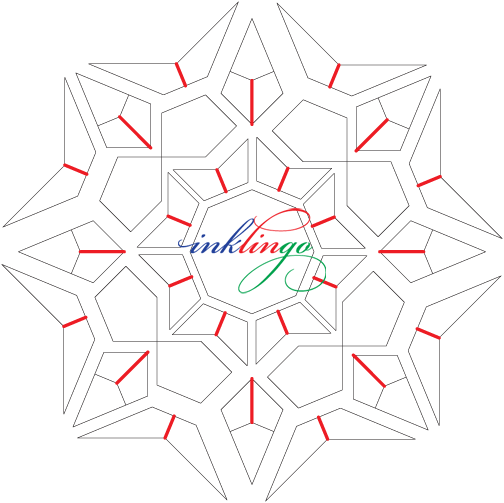 It is a great book, even if you don’t expect to make the diamond patterns. 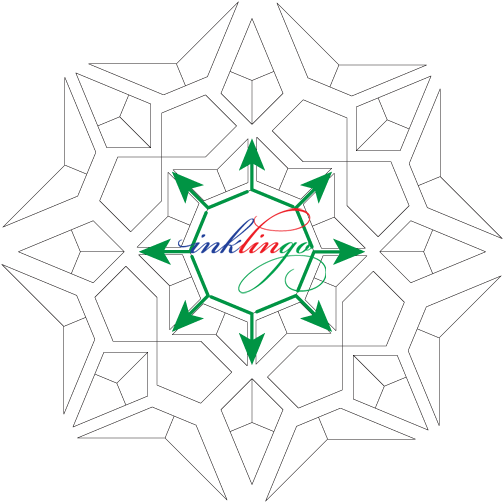 I have also put free hand piecing videos on YouTube. I continue working my way out from the center, row by row. By printing with Inklingo, fussy cutting with freezer paper templates, and combining hand and machine piecing, I was able to sew this Color Burst block in a few hours. I don’t think you can tell which seams were sewn by hand and which were sewn by machine. Every intersection is perfect and it presses beautifully with the seam allowances twirled around most of the intersections. I could have spent this much time just basting or gluing but there are too many more of Sharon’s designs I want to make to spend my time that way! 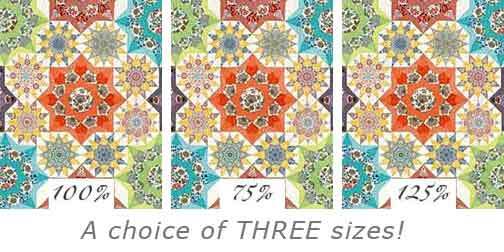 Hybrid piecing works for other designs in Sharon’s book, Lucy Boston Patchwork of the Crosses, and the designs in the Millefiori books by Willyne Hammerstein too. 1. 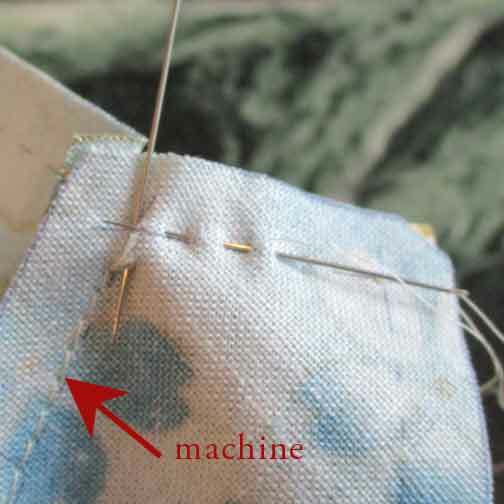 Look for opportunities for “continuous stitching” by hand. 2. Identify the other seams that you can chain piece by machine. 3. 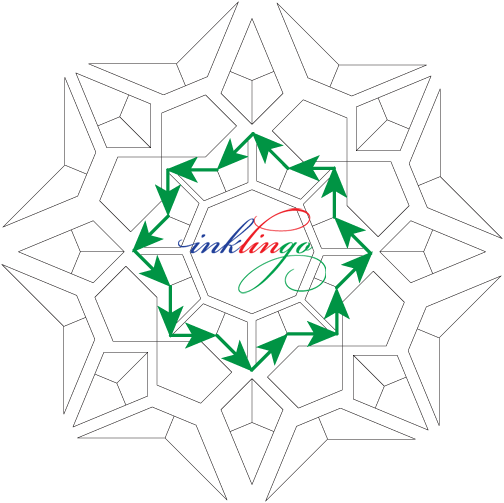 Chain piece by machine, sometimes edge to edge, sometimes crosshair to crosshair, sometimes crosshair to edge, sometimes edge to crosshair. 4. 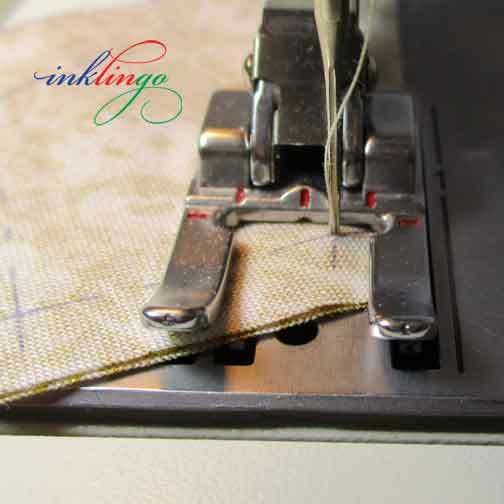 Sew by hand to finish, sewing continuously whenever possible. I absolutely love Sharon Burgess’ designs and I’m ready for my next Color Burst. 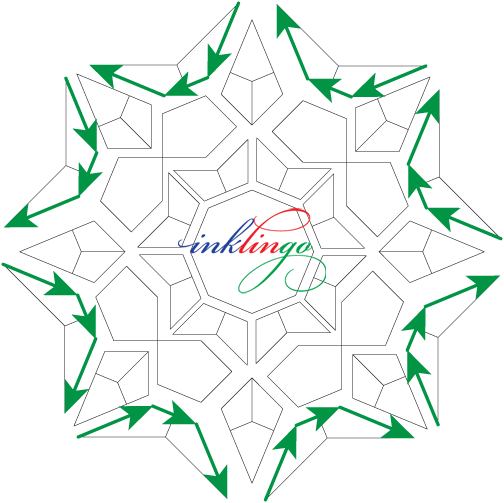 If you are new to Inklingo, this VIDEO on the Welcome to Inklingo page on the website explains how to print on fabric with your Inkjet printer. 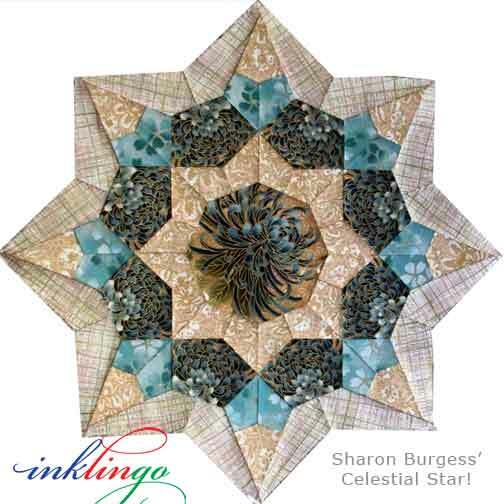 I hope that Sharon’s beautiful book will sell even more copies because Celestial Star is inklingo-able! I would love to see what YOU make! I have more to say about Sharon’s beautiful book, so please subscribe (top of right side-bar), so you won’t miss anything. As usual, the new Clamshell Edges and Celestial Star shape collections and book are on sale at a super-low price. The introductory price on Celestial Star ends tonight at midnight Eastern time. Have you made a donation to help the hurricane survivors? I have extended the offer until the 17th. If you donate at least $15 to the American Red Cross between September 3 and September 17 and email me (linda @ lindafranz.com), I will give you the new Clamshell Edges 3.5 inch shape collection, FREE. Have you chosen fabric for Celestial Star yet? 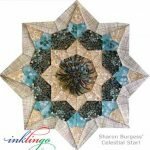 Sharon Burgess’ Celestial Star with Inklingo! Thank you, Donna! That’s nice. I must agree with Cathi! I love watching you sew! What a lovely comment. Thank you, Cathi!! The shapes in Celestial Star are SO tempting, but I’m doing my very best to resist until I finish making ribbon flowers! When I finally do get a start on this, I think I will do some hybrid piecing – just to get it done more quickly and get back to some curved piecing. As a confirmed hand piecer who learned everything I needed to make my hand piecing better and better from the Quilted Diamonds 2 book and lesson on the DVD, I wanted to leave a comment about how invaluable they are for anyone just getting into hand piecing or, for that matter, for anyone who wants some of the very best tips and lessons to be had. There is nothing better than that book and the lesson on the DVD!!! Plus the DVD is so well done – very, very professional and relaxing to watch and listen! It truly is like having a one-on-one lesson in person with you. It really is a master class on hand piecing!